The new Great Chappaqua Bake Sale Co-Chairs. 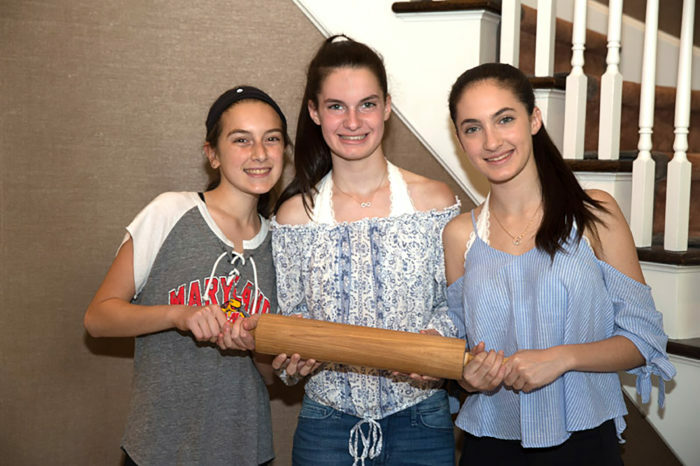 The Great Chappaqua Bake Sale, a delicious annual tradition since 2010, has announced that incoming Horace Greeley freshmen Rebecca Blum, 13, and Charlotte and Sophia Spiegel, both 14, will take over leadership roles in 2018. “We’ve all been involved since the very beginning,” said Rebecca. “It’s a very rewarding feeling to know that we are making a difference in so many kids’ lives.” Since its inception in 2010, the bake sale has raised $146,000 for the No Kid Hungry program of Share Our Strength, which is a leading national organization dedicated to fighting childhood hunger. The Chappaqua sale has also received $50,000 in matching donations from Domino Sugar, making the total raised for the organization almost $200,000. Founded by Chappaqua residents Holly Blum, Allison Spiegel and Jessica Reinmann, the Great Chappaqua Bake Sale has always had a two-fold mission: to raise money for kids in need, and to impart social responsibility to the organizers’ own children and the community at large. Share Our Strength and the Bake Sale for No Kid Hungry program were always the driving force behind the Chappaqua effort, noted Blum. The program encourages local communities to host bake sales to support the organization’s mission of ending childhood hunger. After hearing about the program from an infomercial, the founders contacted the organization. The bake sale serves as a concrete reminder for the kids that not all children are lucky enough to be able to grab a treat when they are hungry; so many kids do not have that privilege. While Rebecca, Charlotte and Sophia have always been involved with the event, 2018 will mark the first year they are truly in charge. The girls are particularly excited about getting more kids involved, and spreading the word that philanthropy is an important activity. “Trying to get other teens involved is a huge goal for us,” said Sophia. “If we can do this with only three of us, imagine if 1,000 teens get involved.” To that end, they have also started a new social media campaign, with Facebook and Instagram accounts for the bake sale. “Every Friday we post ‘Hunger Fact Friday’ on our Instagram feed so kids get a real-world picture of what’s going on” said Charlotte. “So far, we have 150 followers and we are definitely aiming for more!” The girls have also been busy soliciting raffle prizes, organizing bakers, and scheduling volunteers for the day of the event. The Great Chappaqua Bake Sale has been hosted in conjunction with the Chappaqua Children’s Book Festival since 2012, when the festival organizers asked the Bake Sale to be its exclusive dessert providers. “We were thrilled at the possibility of reaching exponentially more people,” says Blum. In the past, the sale has attracted thousands of visitors. In order to supply enough baked goods, the organizers recruit between 80 and 100 individual volunteer bakers, plus local businesses, to make and donate the treats. “It’s always such a special day for our town and a great way to celebrate children,” added Spiegel. The Great Chappaqua Bake Sale will take place at the Children’s Book Festival in Chappaqua on September 29 from 10 a.m. to 4 p.m. Inside Chappaqua asked Rebecca, Sophia and Charlotte to share a favorite recipe. Here’s one for peanut butter balls, which are so popular they often sell out! Mix the first five ingredients together in a bowl. Shape them into 1 inch round balls. Coat with graham cracker crumbs. Let chill in the refrigerator for at least 1/2 hour. Bettina Prober is a die-hard fan of peanut butter who will be at the Great Chappaqua Bake Sale early to secure her peanut butter balls!